Sophomore goaltender Kenzie Kelly (1) keeps an eye on the play. Freshman Britt Nawrocki (8) scouts the scene and gets ready to make a pass on a two-on-one bid. 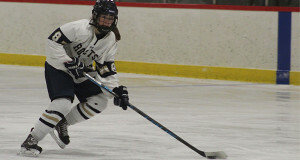 Coming off of a 3-3 tie with arch-rival Wellesley on January 16 at Babson, the Needham High girls varsity hockey team traveled across town to St. Sebastian’s for a neutral site contest against Natick on Friday evening. 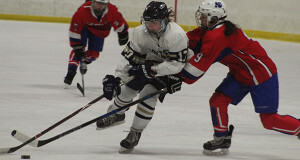 On December 15, the Needham girls earned a convincing 3-0 victory at Natick, behind a 15-save shutout by sophomore goalie Kenzie Kelly. On Friday, the Lady-Rockets (7-1-2, 4-1-0) saw more of the same from Kelly between the pipes, who registered 17 saves en route to a 4-1 victory to complete the season sweep of Natick. However, the win did not come as easily as the first time these two squads met back in December. The game remained scoreless after one period, despite Needham carrying the majority of the offensive play. 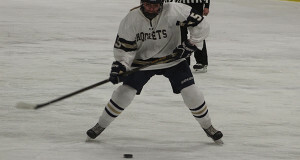 At 2:12 in the second period, junior forward Celia Blaszkowsky drew first blood for Needham on the power play, hammering home a loose puck on the backhand between the face-off circles to put the Rockets ahead, 1-0. Senior Brooke Reilly (5) tees one up from the point on the power play. Natick began to pick up its intensity and started generating some sustained zone time in the Needham end. A massive glove save by Kelly on a Natick two-on-one bid with 9:31 to play in the period preserved the one-goal lead. Lexi Schmalz nearly doubled Needham’s lead to 2-0 later in the period after dangling a pair of Redhawks defenders and dashing in on a breakaway, but was turned aside by the right pad of Natick goaltender Lilly Fangel to keep it a 1-0 game at the end of two periods. Just 41 seconds into the third period, Schmalz redeemed herself following the missed breakaway bid by firing home a wrist shot after picking off a Natick breakout pass and skating in on a mini-breakaway to make it a two-goal game. The Redhawks got one back on a wrist shot from the high slot with 11:58 to play to cut it to a 2-1 game, forcing Needham to tighten up defensively to try and preserve their lead. Senior captain Lexi Schmalz (17) fights off a stick check and carries the puck into the offensive zone on a rush up the ice. Still trailing 2-1 with 1:30 to play, Natick pulled their goaltender for an extra attacker in an attempt to knot things at two. With 1:18 to play, freshman forward Britt Nawrocki delivered the dagger by firing a puck the length of the ice and into the empty net to give Needham a 3-1 lead. Senior Elizabeth Phelan put home some insurance on a two-on-one bid moments later off a feed from Schmalz to make it a 4-1 game. Needham prevailed by the three-goal final.